Anyone looking for a unique take on the Louis Ghost Chair will be able to buy one at auction as part of the “Losing the Plot” exhibition. London-based store Lifestyle Bazaar will be hosting the exhibition as part of London Design Festival. Nine designers have customised the Louis Ghost Chair – showing it in a completely new light – and following on from the festival each chair will be auctioned off in aid of the Children with Aids charity. Visit the exhibition from September 24 – 27, with auction to follow October 8. Last Chance Bank Holiday Steal! Today is your last chance to save 20% on the Louis, Victoria or Lou Lou Ghost Chairs, all available at Graham & Green. The bank holiday weekend has drawn to a close, but for those of you who were out and about instead of surfing on the net, there’s still time to get a bank holiday deal. Click here to shop for your perfect Ghost Chair at Graham and Green. Don’t forget to enter the voucher code A9AAUG at checkout to qualify for 20% off. The summer sales continue as stylish interiors retailer Graham and Green offer more summer savings. They are currently offering up to 30% off office related products – but don’t worry if you haven’t got an office to furnish because all of their range would look stunning anywhere in the home. 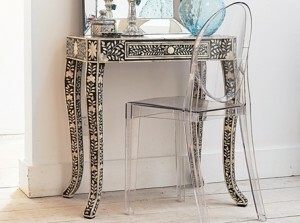 Sale items include the crystal victoria ghost chair shown above with the beautiful Black Bone Inlay Dressing Table. The Victoria Ghost Chair is quickly becoming the Kartell Ghost Chair of choice. Perhaps it’s the laid back, casual arm-less style that makes it a bit more versatile than the Louis Ghost Chair. Be it the Louis or Victoria, both chairs are available from Graham and Green at the reduced price of £137 and £116 respectively. Offers available until 31st August 2009 while stocks last. Click here to visit store. It’s that time of year again when we welcome the summer sales, and there are some serious bargains to be had on the ghost chair range. The popular classic Louis Ghost is now available for just £143 at Furniture Village. 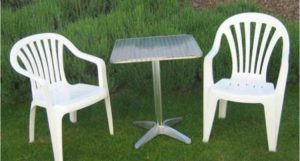 This cheap ghost chair is available in crystal (clear) or glossy black and if you live near to a Furniture Village store you can collect it free to avoid delivery charges. Graham and Green are also offering 15% off non-sale items when you use the discount code M9A35. You can therefore grab a Louis Ghost for just £138 plus postage and packaging – this is surely an offer not to be missed! Furniture Village and Graham and Green have both launched their summer sales, so now is definitely the time to buy a cheap ghost chair. If red will fit into your decor, then the glossy red victoria ghost could be what you’re looking for. It’s currently available in the Graham and Green sale with 50% off. If you’d prefer a more neutral colour, then Furniture Village are offering the Victoria Ghost in crystal, for £116! 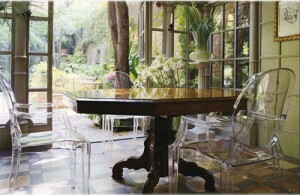 To learn more about the Kartell Victoria Ghost Chair click here. Let’s not forget the chlidren. 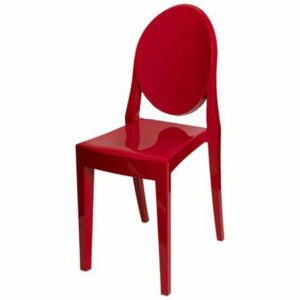 A colourful Lou Lou Ghost Chair fits perfectly in kids bedrooms and playrooms. Whatever chair you choose, there are definitely some savings to be made. Happy shopping! Graham & Green Bank Holiday Special! This may bank holiday weekend, Graham and Green are offering 20% off everything! 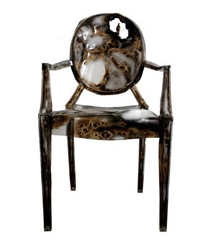 The Louis Ghost Chair is available in crystal, black and smoke. Taking into account the 20% discount, you can grab one of these for just £130. If you prefer the Victoria Ghost, buy from Graham and Green in orange, glossy red, glossy white, crystal or smoke.